Gavan Hennigan is approaching Antigua with a world record in his sights. 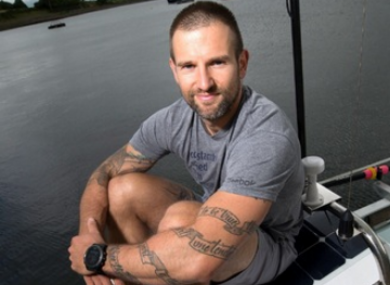 GALWAY MAN GAVAN Hennigan is on track to create history by completing a solo row across the Atlantic Ocean in record time tomorrow. Hennigan began the Talisker Atlantic Challenge in the Canary Islands 49 days ago and is now fewer than 100km from the finish line in Antigua. Italy’s Matteo Perruchini currently holds the world record for the feat, having completed the crossing in 52 days just under 12 months ago. Hennigan, 35, is leading the solo category and third in the overall race, which means he is currently ahead of boats which contain teams of up to four people. “I’m focused on controlling the controllables,” Hennigan said today from the Atlantic. “I know about the chasing teams but I can’t do anything about what they’re doing. I can only focus on rowing my boat and pushing myself to the limit to get to Antigua as fast as I possibly can. “My goal before this race was to be the first solo man home and to set a new Irish record. I’m going to achieve that. I’m fighting hard out here with my body and my mind. “I’m focused on the next stroke and the one after that. “I’ve got plenty of water in front of me and I’ll be pulling hard each and every minute I’ve got left out here. Hennigan, who is raising money for Jigsaw Galway and Cancer Care West, is expected to complete the race early tomorrow, on his 50th day of racing. He is an experienced endurance athlete who has adventured to all seven continents, his exploits encompassing mountaineering and ultramarathon running, distances beyond the standard 42.2km. Previous achievements of Hennigan’s include posting the third fastest time in the world’s coldest adventure race — the Yukon Arctic Ultra — which involves running 300 miles in five days in -30C. Email “'I'm going to raise the tricolour high': Galway man to make history after 7 weeks rowing the Atlantic alone”. Feedback on “'I'm going to raise the tricolour high': Galway man to make history after 7 weeks rowing the Atlantic alone”.